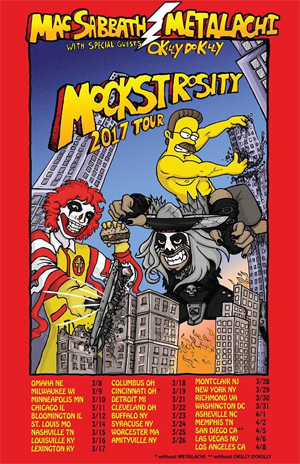 The Mockstrosity Tour 2017 - starring the kings of fast-food themed BLACK SABBATH covers MAC SABBATH and METALACHI: The World's First and Only Heavy Metal Mariachi Band - has kicked off. The tour will also feature special guests, Ned Flanders-themed metal band OKILLY DOKILLY. No, you're not dreaming - the heavy-metal-shtick trifecta is upon us and you can witness them all in one night! Tickets are on sale now via individual venues. In celebration of the tour kick off, MAC SABBATH is finally releasing recorded music! Their viral hit cover track "Pair-A-Buns", will be available via Flexi Disc during the tour, available only inside their official new coloring activity book - chock full of ridiculous images to color, dots to connect, mazes to solve and more. You can only get the coloring activity book and Flexi Disc directly via the band on tour as of now - bring out your inner kid and pick them up at the MAC SABBATH merch booth at your local tour stop! Take a look inside the new book with Ronald Osbourne and brace yourself for a shocking discovery below.